Balcony Systems is the market leader in innovative and advanced glass balustrading, juliet balconies and curved patio doors. These unique products allow designers, property developers and architects to create interesting, yet cost effective, designs and shapes both for new build, refurbishment and renovations. The complete history of the company dates back to 1984 when using technology from his successful awning business a computer-controlled method of bending awning frames was developed which soon led to requests from the construction market to start bending aluminium profiles. This evolved into curving aluminium sections, windows and doors using internally developed and unique technology. In the early 90s the company developed further into the field of balconies and balustrading, developing a unique balustrade solution that allowed large spans of clean glass. The exceptional products quickly took off and by 2012, Balcony Systems is fulfilling orders for well over 10,000 metres of balustrading per year in the UK market alone. New developments include sections that are designed to be used for both curved and straight requirements. In November 2010 Balcony Systems moved into their new refurbished premises in Blindley Heath, Surrey. 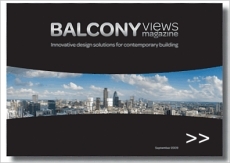 Balcony Views magazine was launched as an effective way of communicating ideas, innovations, practical information and design concepts to architects, contractors, developers and self-builders.